The new Failed States Index, published yearly by Foreign Policy magazine and The Fund for Peace, is just out and it comes as no surprise that most states with cases at the International Criminal Court are highly ranked as “failed.” The degree to which a stated is failed is determined by a compilation of 12 indicator scores. Here, I will put aside my skepticism that “state failure” has become a conceptual garbage can to collectivize the world’s governance problems and speculate about the nature and relevance of a correlation between failed states and international judicial intervention. 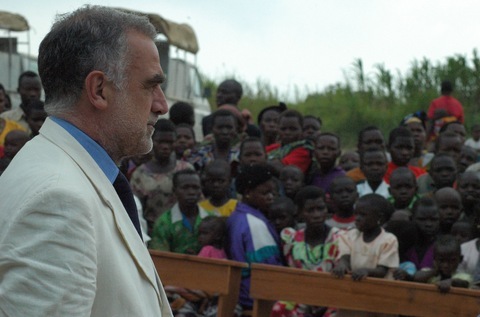 Former ICC Chief Prosecutor, Luis Moreno-Ocampo, visits a massacre site in the DRC. These factors make atrocities more likely and aptly characterize most of the conflict situations among ICC states, particularly those with an ethnic dimension and where electoral contests spark violent protests. Many of the state failure indicators are consistent causes and consequences of atrocities but, of course, not all failed states are home to such mass human rights violations. The Court’s mandate puts pressure on ruling elites to mete out accountability domestically or find themselves in The Hague alongside their rivals. In practice, investigations and prosecutions are imbalanced in this regard. For example, ruling elites in DRC, Uganda, Cote d’Ivoire have successfully resisted the pressure for domestic trials but have not been called to account at the ICC for their own alleged crimes. As alluded to above, the ICC can and will only intervene selectively. Impunity gaps and the absence of rule of law make atrocities and human rights violations possible and necessitate international judicial intervention. Second, all the ICC states, with the exception of Libya, are ranked in the top third of the index and are in a post-conflict phase (more or less). It’s conventional wisdom that addressing impunity gaps for atrocities is necessary for successful peacebuilding and statebuilding. But the UN’s loosely coordinated approach on rule of law is not part of any consolidated international justice regime. Also, the ICC does yet have the capacity to promote “positive complementarity,” whereby the the Court and civil society assist with building national judicial capacity in order to preclude the need for international judicial intervention. The upgrading of national justice systems has mostly been limited to the requisite, but tedious, constitutional and legal changes required upon ratifying the Rome Statute and states parties have a poor track in this record. Third, is ICC judicial intervention merely more possible in failed states, because strong states can politically and legally contest it? Arguably, atrocities can occur in stronger states. When political elites are the perpetrators and state organs are used to carry out atrocities – as is the case in Syria and Sudan – there is just cause to ask whether the perceived need to commit atrocities against civilians implies weakness or the ability to commit atrocities implies strength. Nevertheless, the ICC has found such cases of perpetrator regimes in failed states to be impenetrable. Finally, it is interesting to consider the last indicator: intervention by external actors. The description identifies military, economic and humanitarian intervention as possibly weakening a state, but not judicial intervention. However, “humanitarian or strategic military intervention into an internal conflict or for regime change” is not dissimilar to the intentions and effects of judicial intervention, i.e. deterring and/or removing political and military elites who commit atrocities against civilians. Does ICC intervention exacerbate state failure or the conditions associated with the indicators above? For example, the ICC can unintentionally entrench or create new impunity gaps by not prosecuting those most responsible on all sides, or can weaken perceptions of the legitimacy of the state and rule of law. This entry was posted in Central African Republic (CAR), Complementarity, Democratic Republic of Congo, International Criminal Court (ICC), Ivory Coast / Côte d'Ivoire, Kenya, Libya, Sudan, Uganda and tagged Failed states. Bookmark the permalink. Thank you for the post. I will not belabour what I see as the pointlessness of such a study/report. It adds no value to the state of States or otherwise. Indeed, some States might be struggling to market themselves and so such a report does more harm than good. That said, the report’s objectivity is incredulous by, for example, placing Libya at 50. It may not be a failed state but assuming the study was done for the period 2011/2012, seemingly the worst of Libya’s experience in decades, I fail to see how it ranks better than Ivory Coast, Kenya and Uganda, to name a few for the same period. Interestingly, it is such reports that in my opinion enable/justify (expat) employees of international organisations (such as the UN) to claim exorbitant hardship allowances for these seemingly ‘failed’ states. As for the Postcards from Hell, 2012…of course those would be the pictures in descending order. Like you said in your earlier post…they are the kind of NGO postcards used to raise funds. Just my thoughts.